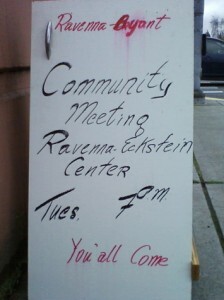 Tonight, Tuesday, May 5, the Ravenna Bryant Community Association will hold their spring community meeting. 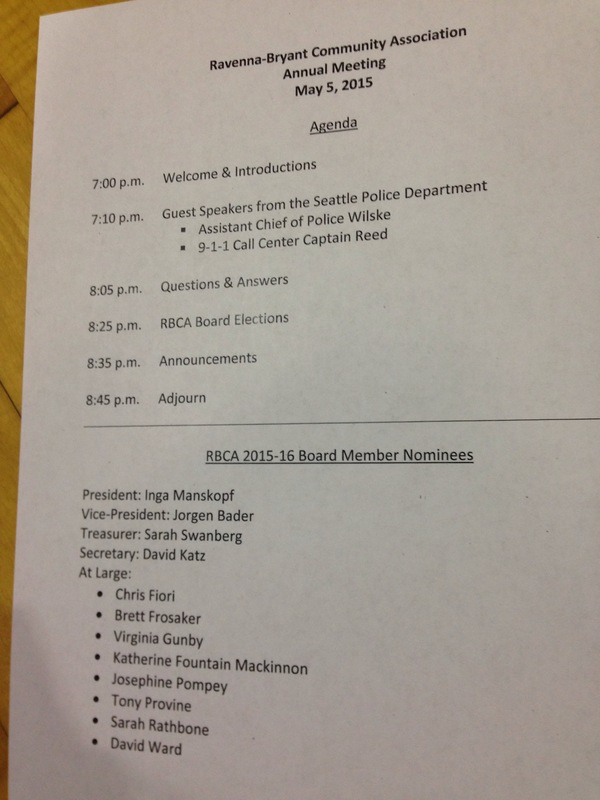 The meeting is being held at the Ravenna-Eckstein Community Center (6535 Ravenna Avenue NE) from 7-9 PM. We’ll be there, providing live coverage below. Summer is here! And so is the Seattle Parks and Recreation wading pool/outdoor swim/spraypark season. Wading pools are filled when the day’s temperature has been forecast to be 70°F (21°C) or higher. If you want to double-check with Parks & Rec before loading up the picnic basket, there’s a Wading Pool Hotline you can call (updated daily by 9:30 AM): 206-684-7796. The city-wide Wading Pool and Spraypark Schedule can be found here (small PDF; lots of Comic Sans). Outdoor movies at Magnuson Park (7400 Sand Point Way NE) are back for a fourth season starting Thursday, July 10! 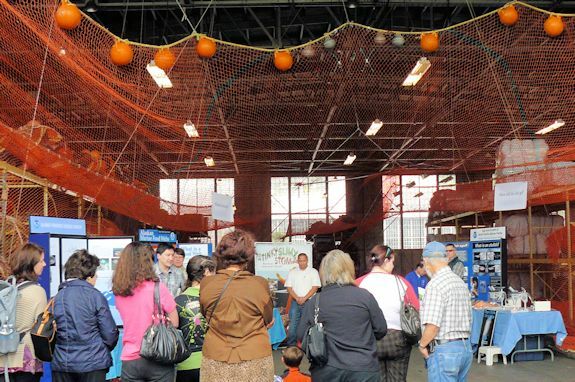 For the weekly food truck schedule, details on seating, parking, and more, visit the PEMCO Movies at Magnuson Park homepage. 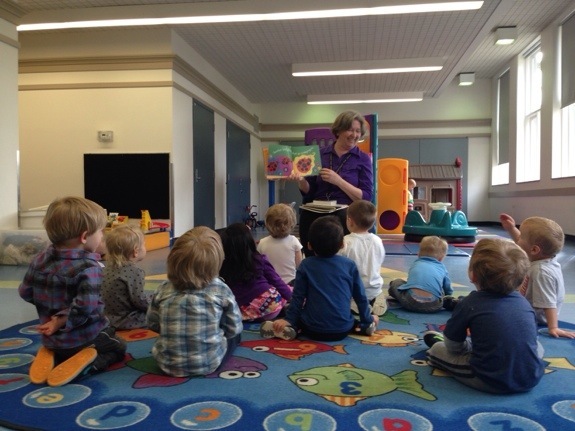 After 20+ years coaching and teaching local tots, Carol Rasp is retiring. Or, in her own words, “Quitting.” More fitting as Rasp as more energy at 60-something-or-another than most 30-year-olds I know. She’s moving on to more adventures, many involving her husband and their tandem bicycle. 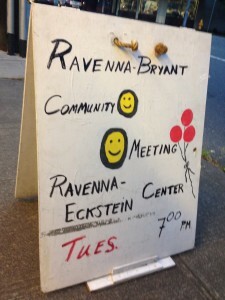 In her honor, there will be a potluck party at the Ravenna-Eckstein Community Center (6535 Ravenna Avenue NE) on Wednesday, June 4, starting at 6:30 PM. The center itself is providing hamburgers and hot dogs. If you and yours are planning to attend, please call the center at 684-7534 to RSVP. 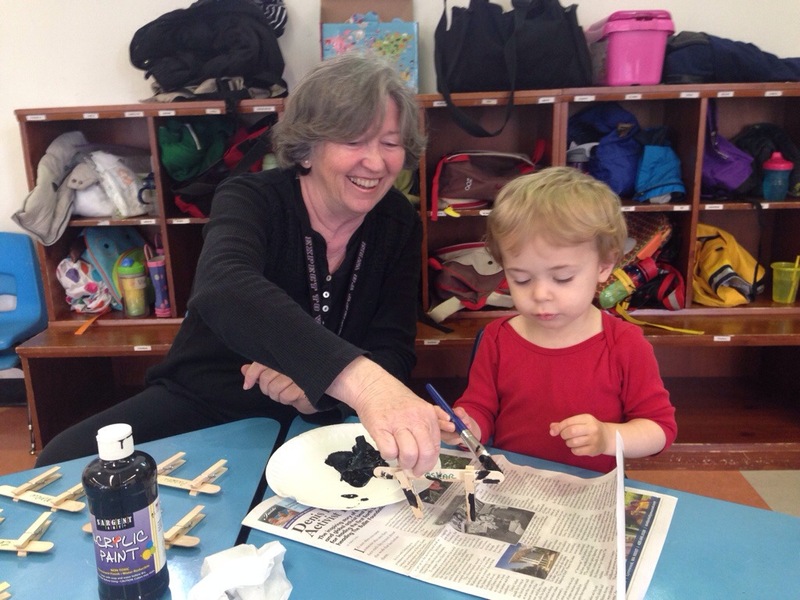 Carol Rasp works with Ravenna Blog Intern #2 on an art project in class. The outdoor basketball court behind the Ravenna-Eckstein Community Center is getting some work done. Weather and contractor permitting, over the next week or so (starting Tuesday, May 27), apshalt-cracking tree roots will be removed, the playing surface will be repaired and leveled, and new standard-height hoops will be installed. RECC users and visitors: The small parking lot off Ravenna Avenue NE will be closed during the project for staging equipment. 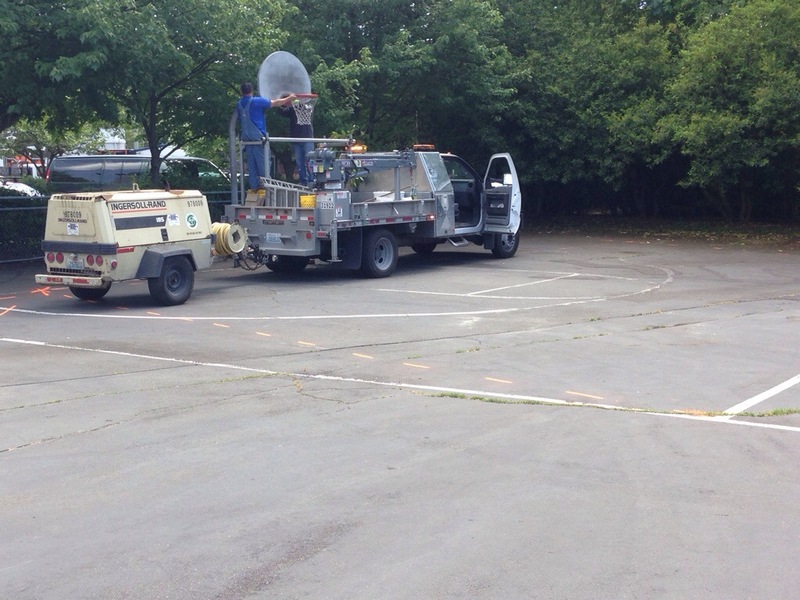 Workers began removal of the old basketball hoops on Thursday, May 22. In case you’re not sure where it is, the RECC’s outdoor basketball court is tucked between the small parking lot off Ravenna Avenue NE and the tennis courts. The court lines are faded. 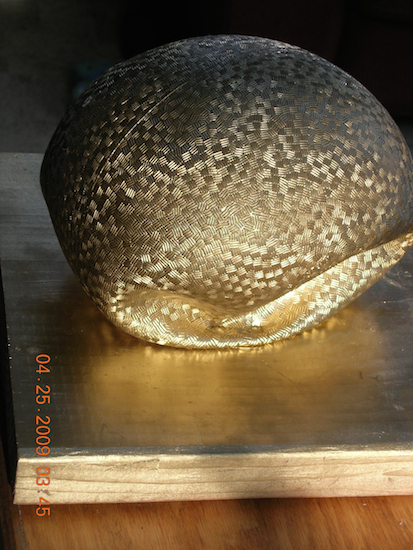 The playing surface is uneven, cracked asphalt. The hoops are not set at a standard height. 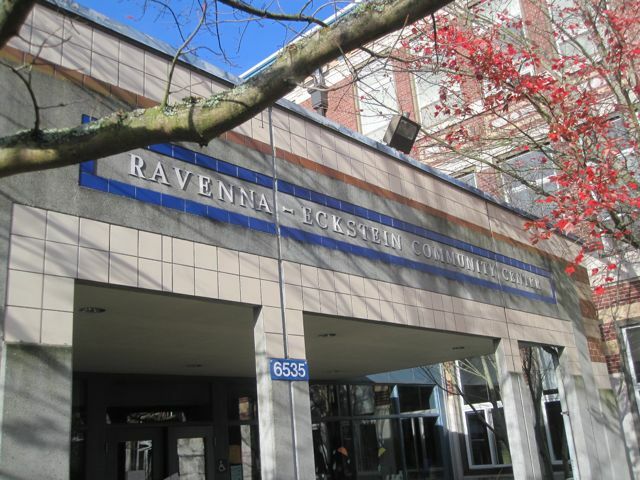 RECC coordinator Tim Ewings tells us that last fall the Ravenna-Eckstein Advisory Council put the wheels in motion to get the project started, requesting funds for a 2014 capital project. The plan was approved (funds coming from the Associated Recreation Council who partners with Seattle Parks and Recreation to provide instructors), a project manager fleshed out the details, timing, and final pricing, and the work has begun. In the event that the work schedule changes, we will post updates here. One of the topics of the next Ravenna-Bryant Community Association community meeting (Tuesday, May 6 at 7 PM, Ravenna-Eckstein Community Center) is near and dear to many of our hearts here in Northeast Seattle: Hugh Sisley. We’ve also heard that someone Steve Johnson, Director of the Office of Economic Development, will be there to talk about the city’s Only in Seattle Initiative (Grants! Tools! Business Improvement Areas!). We will be attending the meeting, and you can read our LIVE COVERAGE below (starting around 6:45 PM-ish) if you are unable to attend. UPDATE (Tuesday, May 6, 3:20 PM): Looks like KOMO News is thinking about Hugh Sisley today, too: Reporter Joel Moreno teased some shots allegedly from inside one of Sisley’s rentals. 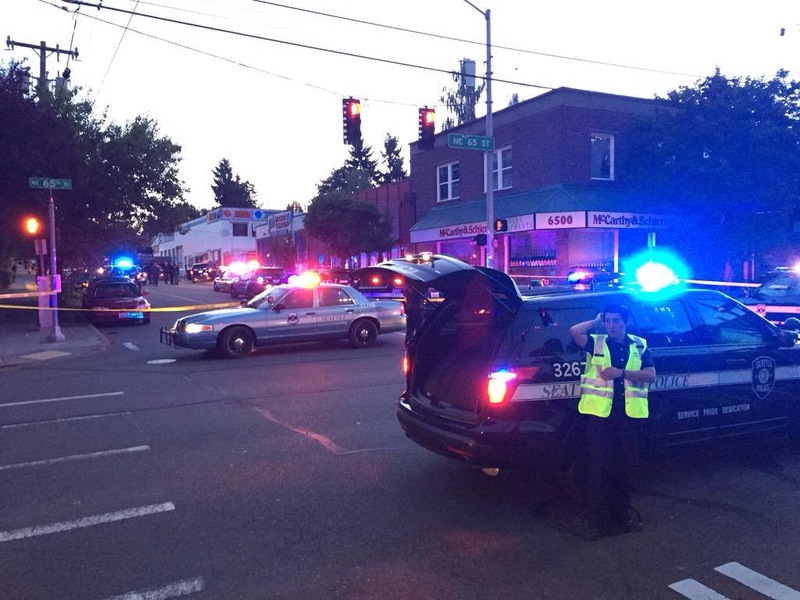 UPDATE (Wednesday, May 7): KOMO News did indeed have a story about Hugh Sisley and the fines last night, which also features a walk-through of one of Sisley’s properties in Ravenna (6515 16th Avenue NE). You can read the story and/or watch last night’s report here. [in our best monster truck voice]: SATURDAY SATURDAY SATURDAY! 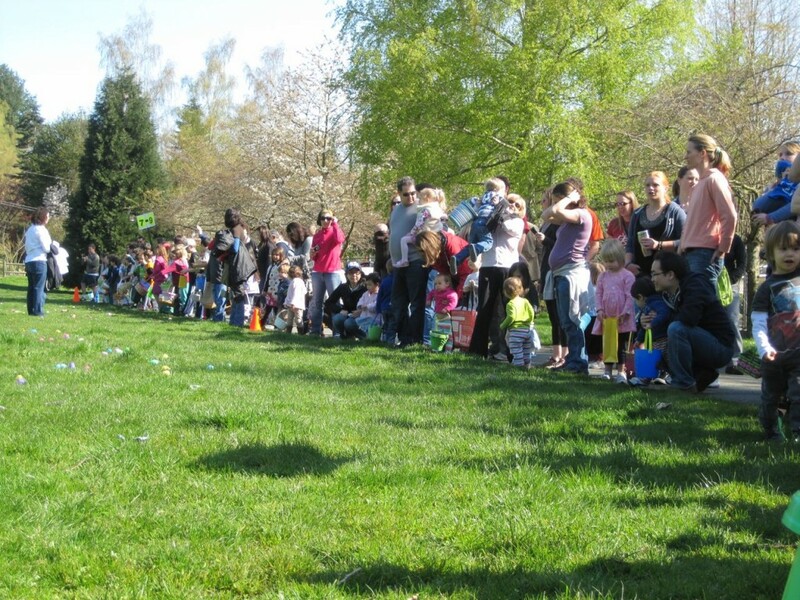 Ravenna-Eckstein Community Center Spring Egg Hunt starting line in 2011. Registration begins at 11:30 am. We partner with Roosevelt Neighborhood vendors for this event that features 3 age-specific egg hunts as well as crafts, games, prizes, inflatables and more! Want to help? We will need people to donate candy and work at the event. For all of these events, you’ll want your kids to bring baskets with which to carry their ovate loot. 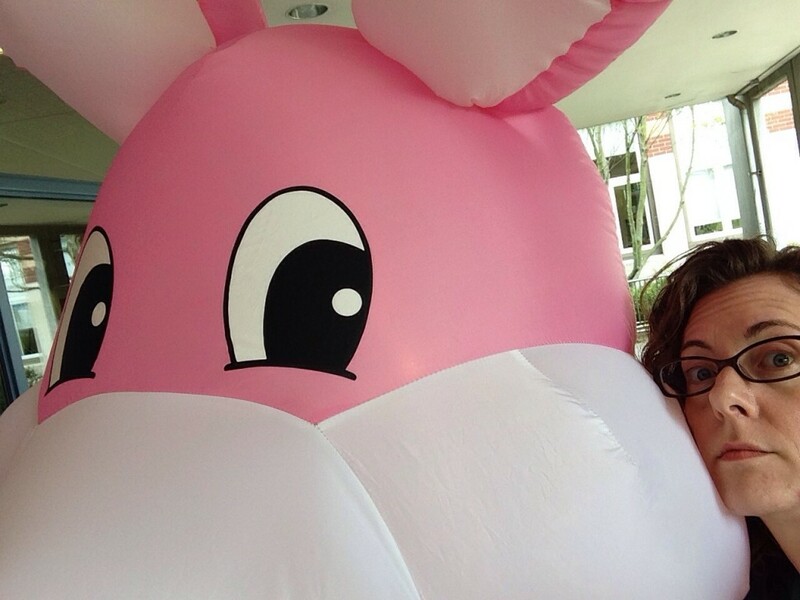 Ravenna Blog publisher posing with the largest holiday decoration in NE Seattle (outside of Candy Cane Lane).